XFL teams could score anywhere from six to nine points after a touchdown. Assuming this was inspired by the 1-2-3 Kid, Vince McMahon’s XFL is going to try something different. 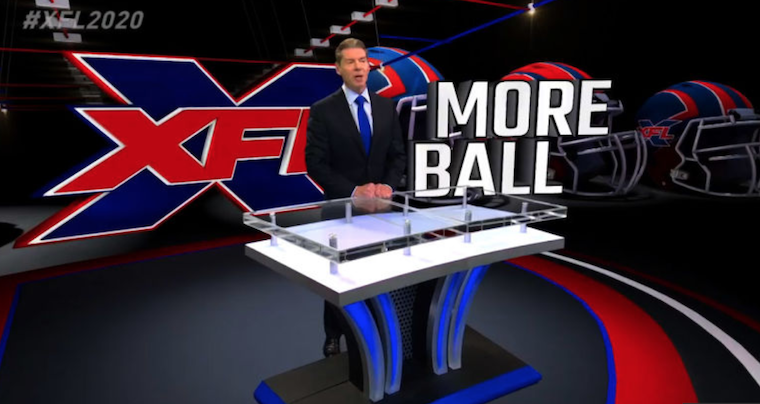 Keeping up with the currently “suspended” AAF, the XFL is not going to kick extra points after touchdowns, and the league will increase the amount of strategy on the post-touchdown play allowing teams to attempt one, two, and three point conversions. Speaking on the PFT PM podcast, XFL commissioner Oliver Luck revealed the league’s plans on the post-touchdown conversion. A team can go for one, two, or three points, and will have one play from scrimmage (no kicking) to score. To go for one, a team will have one play at the two-yard line. A two-point conversion will be from the five, and a three-pointer will take place ten yards from the end zone. After a touchdown, an XFL team can walk away with anything from six to nine points. Considering the AAF only eliminated kicks and the only play was a two-point conversion from scrimmage, the XFL’s idea is better from a strategic perspective. The issue is that the yardage may not be spread out enough to make it worth it to go for three each time, eliminating much of the strategy. Yes, ten yards is further away than two or five, but if you have a great passing team, you will have more room to call a better play. With less than a year to go until their launch, the XFL is already entering uncertain times. With the AAF all but folding, there are fears the XFL will go down that same path before they even set foot on the field. Maybe this extra year of preparation will help the XFL, or maybe the league’s demise is inevitable since it’s not the NFL, but the XFL is certainly going about it the best way they can.